Ryland Homes and its construction partners are building a Twin Cities Habitat for Humanity home as part of the 2012 Builders Blitz. 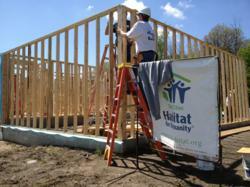 Ryland Homes is building a Habitat home for the 2012 Builders Blitz next to this home going up in Savage, MN right now. "Both Habitat and Ryland are focused on putting families into quality homes that deliver a lot of value and keep maintenance and energy costs down." The professional builders at Ryland Homes will be doing some serious volunteering and donating this summer. Ryland Homes, along with its construction partners, are building a home for Twin Cities Habitat for Humanity in Savage, MN. The project is part of Habitat’s nationwide Home Builders Blitz 2012 which is a partnership between Habitat affiliates and America’s building community. This year’s goal is to use the talents of building professionals to build or restore more than 200 homes in 100 different communities around the country. Twin Cities Habitat estimates that Ryland Homes and its construction partners will contribute $145,000 worth of materials, labor and waived fees towards the home in Savage, which will go up in late May. Ryland Homes is the eighth largest builder in the country, having closed 3,664 homes in 2011. In the company’s 45-year history it’s built 295,000 homes around the country. The Habitat Builders Blitz model was first tried in North Carolina in 2002. Since then, professional builders have partnered with Habitat affiliates around the country to construct more than 860 homes. The Twin Cities Habitat affiliate builds and sells 60 homes a year to low-income, working families. The organization also assists 140 qualified low-income homeowners in completing essential repairs so that they can stay in their homes. Habitat homebuyers pay Habitat’s unique 0% interest mortgage and must complete extensive homeownership training courses and hundreds of hours of “sweat equity” as volunteers for Habitat. More information is available on Twin Cities Habitat at http://www.tchabitat.org and Ryland Homes at http://www.ryland.com.